I can't believe it's been a month since my last post! But I've now recovered from the craziness of the spring — with its two hackathons, two conferences, two new experiments, as well as the usual courses and client projects — and am ready to start getting back to normal. My goal with this post is to tell you all the exciting stuff that's happened in the last few weeks. There's a new Agilist! Robert Leckenby is a British–Swiss geologist with technology tendencies. Rob has a PhD in Dynamic characterisation and fluid flow modelling of fractured reservoirs, and has worked in various geoscience roles in large and small oil & gas companies. We're stoked to have him in the team! We have trained over 120 geoscientists in Python so far this year, but most of our training is in private classes. We wanted to fix that, and offer the Geocomputing class back for anyone to take. Well, anyone in the Houston area :) It's called Summer School, it's happening the week of 13 August, and it's a 5-day crash course in scientific Python and the rudiments of machine learning. It's designed to get you a long way up the learning curve. Read more and enroll. We have several more events happening this year, including hackathons in Norway and in the UK. But the event in Anaheim, right before the SEG Annual Meeting, is going to be a bit different. Instead of the usual Geophysics Hackathon, we're going to try a sprint around open source projects in geophysics. The event is called the Open Geophysics Sprint, and you can find out more here on events.agilescientific.com. 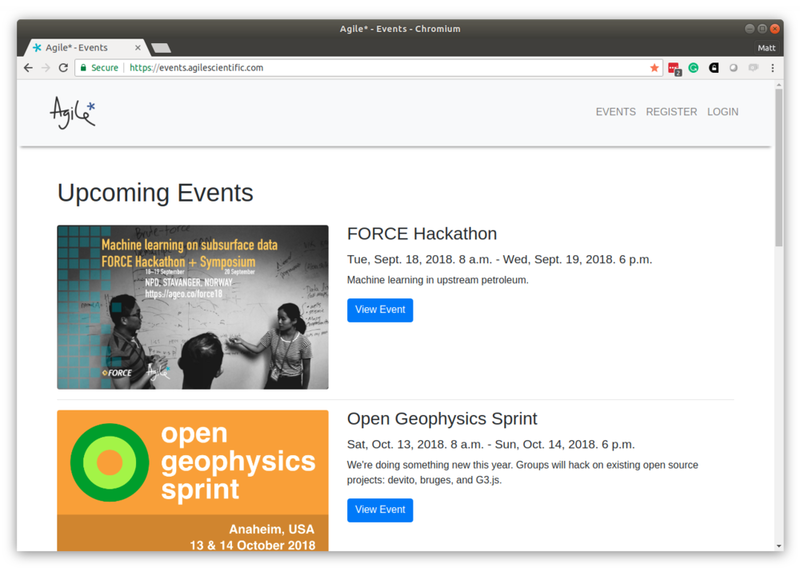 That site — events.agilescientific.com — is our new events portal, and our attempt to stay on top of the community events we are running. Soon, you'll be able to sign up for events on there too (right now, most of them are still handled through Eventbrite), but for now it's at least a place to see everything that's going on. Thanks to Diego for putting it together!